I am not sure how winter is shaping up in your part of the world - with global warming and climate screw-up, it is still quite warm in Bangalore!! But, we have some really cool yearly promotion offer again on GeoTools and CADPower software until December 31, 2012. Special incentive for decision makers in December 2012. Starting November 26, 2012 until the end of this year, we announce a special promotion for all GeoTools/CADPower users. The sweetest deal is on the un-limited site license of GeoTools-CADPower combo software which is now offered at a price of USD 4000 (usual price: USD 7000). You will also receive a free upgrade to the next version (V14) when it is released in late-March 2013. Additionally, all other purchases of GeoTools-CADPower licenses during this period will receive a 10 % discount on the prices shown on the web -AND- will receive a free upgrade to V14 in March 2013. The discounted prices are not shown on the 2CO purchase page. You may place the standard order and send us an email quoting this newsletter / blog post or email correspondence and your discount will be applied/refunded to your credit card while processing the order. If you are paying by check, PayPal or bank transfer, you can apply the discount and send us your payment. If you are paying via bank wire transfer, please remember to pay the bank charges separately. *** CP_WORKSPACE command (CADPower -> More Options -> Workspace Setup): This command was not working correctly. It has been fixed now. Available only in the AutoCAD version of CADPower (2008+ versions). This command has been removed from the BricsCAD version as it did not belong there. 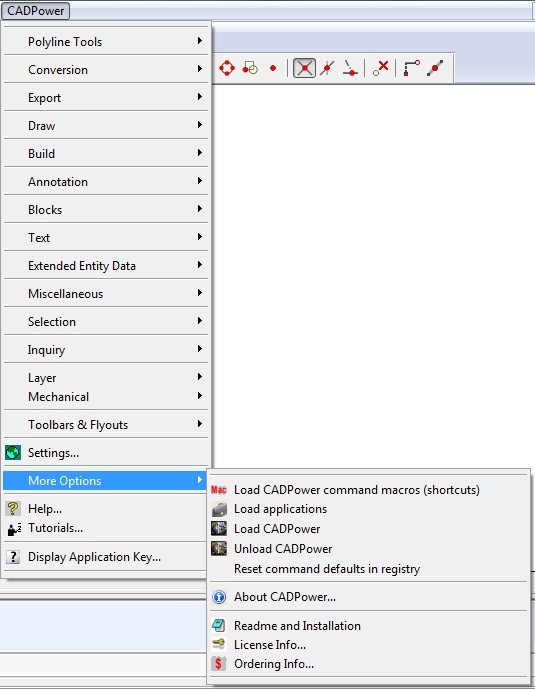 *** CP_APPLOAD command (CADPower -> More Options -> Load applications): This command was missing in the BricsCAD version of CADPower since the GeoTools split. It has now been introduced. *** German translations completed fully: Many thanks to Werner Macho from Austria for doing a wonderful job. A new section called Mechanical added into CADPower for BricsCAD. Under this, we plan to offer some tools that would benefit users who work with 3dsolids, X-Hardware and Assembly modeling under BricsCAD Platinum. *** CP_X-HARDWARE2COMPONENT (CADPower -> Mechanical -> X-Hardware -> Component): The CP_X-HARDWARE2COMPONENT command is used to convert a normal 3DSOLID object or an X-Hardware 3DSOLID object into a Mechanical component suitable for Assembly modeling in BricsCAD Platinum. Assemblies are defined as .dwg components managed from within the main drawing using XREF as the link mechanism. *** CP_X-HARDWARE_BOM (CADPower -> Mechanical -> X-HardwareBOM): The CP_X-HARDWARE_BOM command is used to create a Bill-of-Material of all 3DSOLID parts in the drawing.